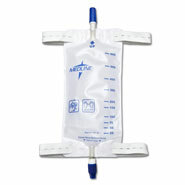 Male external catheter is part of a complete system for men managing incontinence. Durable urine catheter fits comfortably over the male anatomy and secures to the leg with double-sided adhesive tape to catch bladder leaks. Simply throw away after each wear. For use with our leg bag and extension tubing (sold separately). Includes 25 disposable catheters with tape. 3 sizes: S (25 mm), M (30 mm), L (35 mm). Quick service and good quility. A friend has a bladder problem and thought this would be good item to have instead of running back and forth to the bathroom.